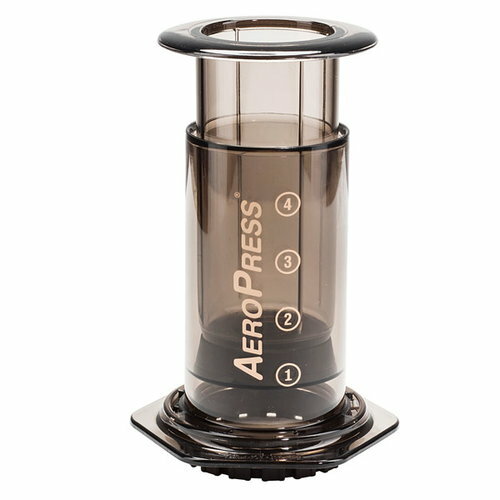 Aerobie's Aeropress coffee maker was designed by the American inventor Alan Adler. In 2003, Adler began experimenting with different ways to make a perfect cup of coffee, and two years and over thirty prototypes later he introduced the finalized design of Aeropress at Coffee Fest Seattle. 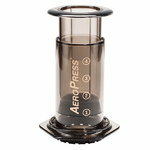 The innovative AeroPress coffee maker allows you to make delicious coffee fast and without expensive machines. The use of the coffee maker is easy: steep for about 10–60 seconds depending on grind and strength and then press the plunger through the tube. You can place AeroPress directly onto the coffee cup. The parts can be cleaned in seconds, and the microfilters ensure the purity and smoothness of the coffee. With Aeropress coffee maker you may also use a finer grind. Aeropress is a great gift for any coffee enthusiast. Makes 1 to 3 cups per pressing in about one minute. 350 filters included. Alan Adler (born 1938) is an American inventor and engineer, who is best-known for his Aerobie flying ring and AeroPress coffee maker. He has created several aerodynamic toys, sailing ships and instrumentation systems for military aircraft, submarines and nuclear reactors. Self-taught Adler has also taught mechanical engineering students in Stanford and given guest lectures at NASA, Google and prestigious schools including Caltech and Princeton. His inventions have been granted over forty patents.